If there is one illness that many people are afraid of, it’s cancer. This is because cancer is one of the most fatal illnesses that is hard to treat. Moreover, there is really no definite treatment for it yet. Although chemotherapy is the most popular treatment for cancer, there is still no guaranty it can cure all types of cancer. This is why another type of treatment has been developed to treat cancer. This treatment is called radiation therapy. This type of radiation therapy is done with the use of a radiation machine. The machine is similar to the X-ray machine will release its charged particles through a beam radiation. The radiation will penetrate the cancer-infected area from outside the body. Internal radiation, on the other hand, is the method of directly placing the radioactive materials in the area around cancer cells. The process is a bit complicated, but it can be more potent. Meanwhile, systemic radiation treatment is the use of radioactive substances that can move through the blood to reach the areas with cancer cells. This works like a regular medicine in the sense that the substances are absorbed into the blood stream. An example of a radioactive substance is radioactive iodine. How Does Radiation Therapy Work Against Cancer? 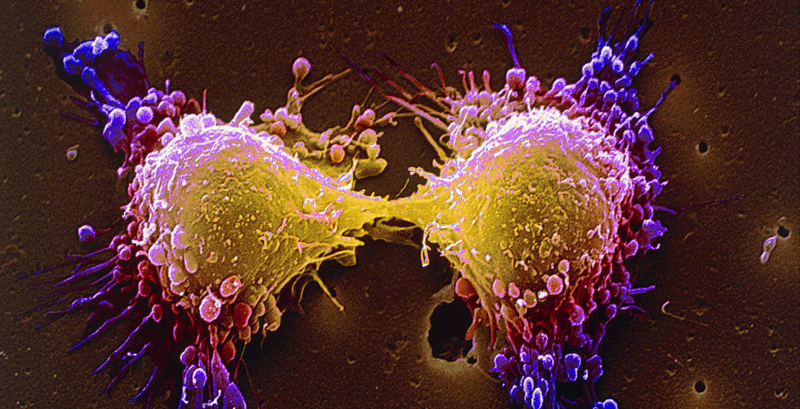 Radiation therapy kills cancer cells by damaging cell DNA. This also can happen by creating free radicals within the cells that kills the cancer as well. Does Radiation Therapy Kill Other Cells? The drawback in using radiation therapy is that it kills not only the cancer cells but also other cells nearby. 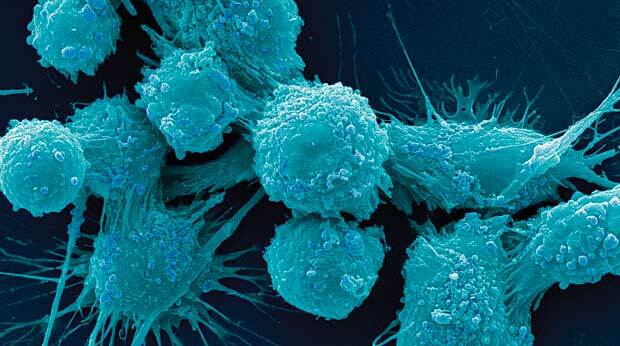 This problem causes side effects depending on which cells are damaged as the result of killing cancer cells. Nevertheless, our tissues have a certain level of tolerance against radiation. It’s your doctor who will determine such levels before this treatment is performed. Why Is Radiation Therapy Needed? Radiation therapy is a powerful treatment against cancer. It’s so strong that other cells may also be sacrificed in the process. Nonetheless, the result is significant. It’s needed when the purpose is to completely eliminate the cancer. This means radiation therapy is used for curative intent, and it can also be used for palliative care to shrink tumors. On the other hand, radiation therapy can also be applied along with chemotherapy. It can also be used for curative intent, control treatment, and palliative care at the same time. How Is Radiation Therapy Scheduled? Before radiation therapy is scheduled, your oncologist will ask you to undergo several tests such as CT scans, MRI, PET, and ultrasounds. All such tests will determine the location and the position of cancer infections inside the body. Once identified, radiation therapy will be applied in the target areas. Radiation therapy may be much stronger than chemotherapy. However, there are risks involved as the radiation can also damage other non-cancer cells. Radiation therapy is ideal for curative intent as it requires patients to be much healthier and tolerant against certain radioactive materials and substances. Persistent sores in the mouth or the neck and face that do not heal within two weeks. If you notice any of these symptoms, it is important to make an appointment with your dentist or primary care physician as soon as possible. It is estimated that over 40,000 people are diagnosed with oral cancer each year. Men face twice the risk than women, and men over the age of 50 face the greatest risk of all. Smoking. Whether you smoke cigarettes, cigars, or a pipe, you are six times more likely to contract oral cancer than nonsmokers. Using smokeless tobacco. Chewing tobacco, snuff, or dip makes you 50 times more likely to develop cancers of the lining of the lips, gums, or cheeks. Drinking a lot of alcohol. 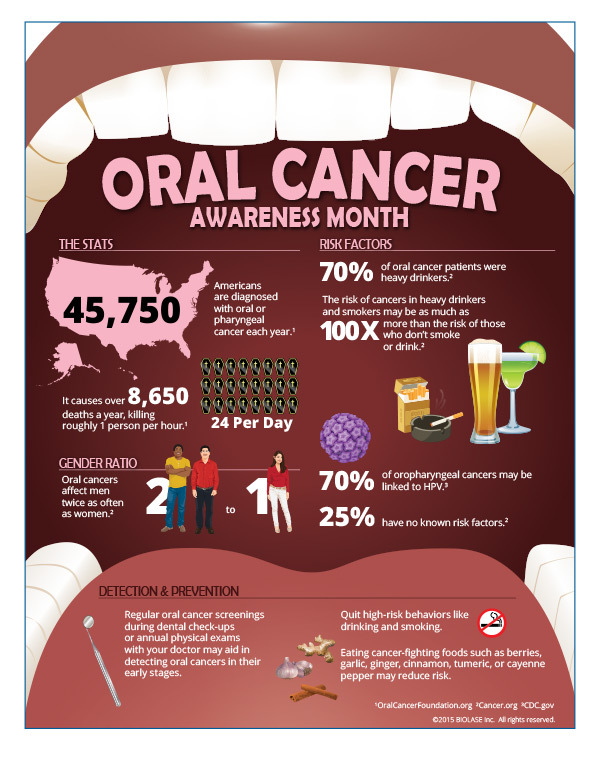 You are six times more likely to contract oral cancer than nondrinkers. Family history of cancer. If cancer runs in your family, then you are more genetically predisposed. Too much sun. If you have excessive exposure to the sun, especially when you are young, it increases your odds of contracting oral cancer. If you have been diagnosed with HPV (Human Papillomavirus), some strains put you at a higher risk for contracting oral cancer. It is important to note, however, that 25% of diagnosed cases of oral cancer do occur in nonsmokers and social drinkers. What Can You Do to Prevent a Diagnosis? Drink alcohol in moderation, and do not smoke or use any tobacco products. Limit your exposure to the sun, and when you are out in the sun, apply UV-A/B sun blocking products on your skin and lips. Do a Self Exam Once per Month – Use a bright light and a mirror to examine all the surfaces of your mouth and lips. Feel for lumps and thoroughly look over every part of your mouth, throat, and gums. Check for enlarged lymph nodes in the neck. If you find anything suspicious, contact your health care professional immediately. See your Dentist Regularly – No matter how thorough, you can’t always see everything, so ask your dentist to conduct an exam at your next visit. 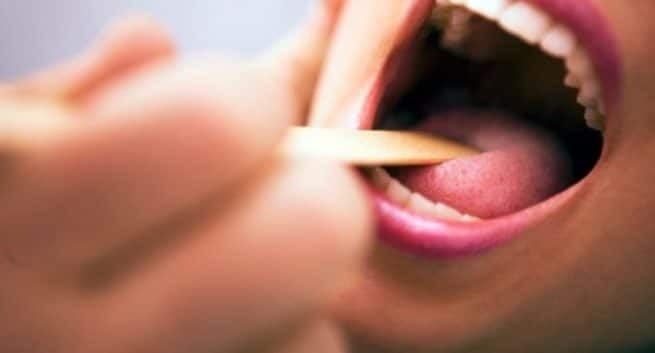 Remember, understanding what oral cancer is and how to detect it increases your chances of successful treatment. 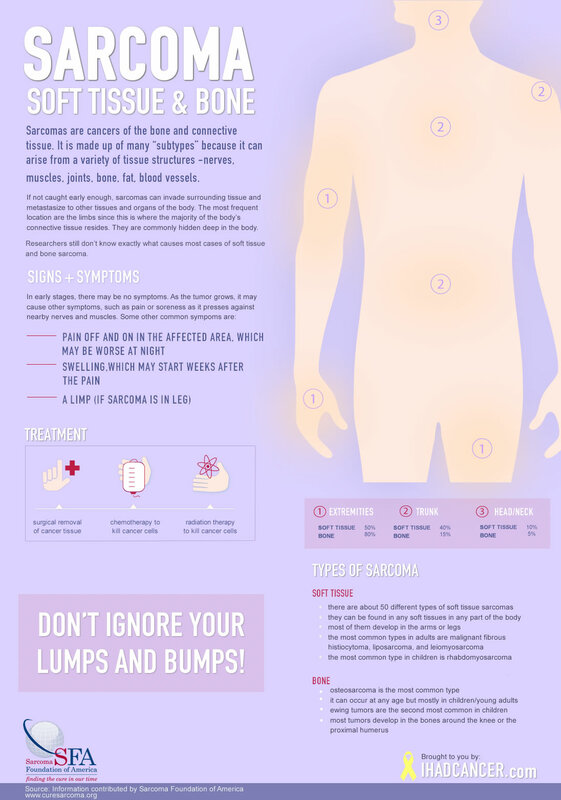 Sarcoma is a rare type of cancer that forms in the connective tissues of the bones, tendons, muscles, nerves, cartilage, blood vessels, fat, and other areas within the body. While there are dozens of types of sarcoma cancer, they are typically broken down into two main types, including soft tissue sarcoma and osteosarcoma. Not only does this type of cancer only affect a small percentage of the population, it also can be extremely difficult to detect. This is because the cancer is not specific to one area of the body, but rather it can be practically anywhere throughout the body. Another issue that makes detection difficult is the fact that the cancer starts to grow in the connective tissues. This allows the tumor to grow undetected for quite some time. This makes it very important to know what the various symptoms of sarcoma cancer are. Unfortunately, most people experience no symptoms during the early stages of sarcoma. As the tumor in the soft tissues grows, it can push against the nearby nerves. This, in turn, can cause a person pain or soreness in the area of the tumor or a shortness of breath. The most common areas affected by soft tissue sarcoma are the knees, legs, shoulders, abdomen, and hips. Other common areas include the arms, hands, head, and neck. Although adults are not immune to osteosarcoma, it is most common among young adults and children. Like soft tissue sarcoma, osteosarcoma is hard to detect, especially during the early stages. The first sign is bone pain in the area of the cancer. Since, children frequently experience growing pains, this early symptom is often overlooked. The primary differences between pain associated with osteosarcoma and other types of pain are that the pain usually worsens in the evening and the pain is centralized in just one arm or leg and not both. Within a few weeks of the first sign of pain, you may notice some swelling in the affected area. The pain and swelling may eventually cause a slight limp. Due to the difficulty of detecting sarcoma cancer, it is extremely important that you discuss any unusual pain with your doctor. A biopsy, ultrasound, CT scan, MRI, and/or bone scan are often used to diagnose sarcoma. In many cases, sarcoma is treated with just surgery, if caught early enough. No matter how healthy you are, it is important to be aware of the early signs and symptoms of cancer. 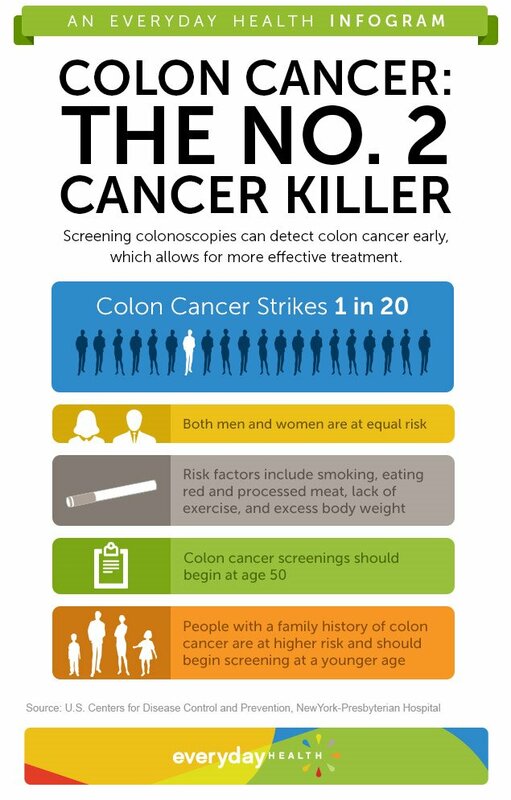 This will enable you to prevent it or treat it as early as possible if you happen to have cancer. Moreover, your doctors can have solid information on your condition. In this way, a more accurate method of cancer treatment can be applied to cure it. Pain is the most common symptom in many illnesses. But when it occurs, many people would suspect it to be associated with cancer, especially if the pain is unusual and excruciating. There are different types of pains you can experience depending upon the type of cancer you have. If you have a brain tumor, you may experience a severe headache all the time. If you have testicular cancer or bone cancer, you will experience the pain right in the beginning stage of these cancers. Weight loss has several factors. There are some illnesses that can reduce your appetite for food. As a result, your reduced diet makes you lose weight. However, there are illnesses that can automatically make you lose weight quickly without affecting your diet. The most common of which is cancer. Cancer consumes a lot of protein. This is because the immune system produces antibodies that also require these proteins. This process inside the body is constant, and it eventually depletes the fats and the protein in the body. Fatigue is another symptom of cancer. Although it can also be a symptom of other illnesses, the fatigue of a cancer patient can experience is somewhat regular. There are times you feel so stressed you almost would like to vomit. Moreover, you will notice that you easily get tired even during even simple movements. On the other hand, there are also times you seem so tired even without doing anything. This is probably because your heart pumps more frequently than normal. Fever that occurs out of nothing means you have an infection inside your body that is growing and spreading. When your body is being attacked by bacterial or cancer infection, our body naturally fights them. Our immune system uses the available resources we have in our body. As a result, our body seems to feel stressed and weak. This condition also weakens our immune system in the long run, so we tend to suffer from fever. If you have cancer, your skin degenerates. It gets dry and pale, and you will also notice some moles, marks, or bumps. Your skin texture changes depending on the type of cancer you have. Some cancer patients notice their skin to be yellowish while others become red or hairy. Sores do not automatically appear when you suffer from cancer. However, they don’t seem to heal when you accidentally have some. This is also the same case with diabetes. The reason behind it is that your antibodies are busy fighting the cancer cells. As a result, less and less antibodies are assigned to heal the sores. Symptoms may vary from one person to another. In addition, some symptoms may be associated with another illness. Furthermore, every symptom has different levels or degrees of severity. The above signs and symptoms may help you determine whether or not you suffer from cancer. Nevertheless, it is recommended you consult your doctor if you experience such early signs and symptoms. Anyone diagnosed with a tumor will always have that moment of terror before the doctors can finalize with the tests and classify the tumor. While malignant tumors are a nightmare, benign tumors are not cancerous and easier to deal with. All tumors share similar characteristics. They are all cells your body doesn’t need but are not destroyed at the right time. They might be old, damaged or deformed cells that don’t do your body any good. These unnecessary cells will then accumulate leading to a growth (tumor) that will vary in size depending on the seriousness of duration of the problem. Benign tumors are simply non-cancerous. The cells in the tumor might be abnormal but they don’t possess the power to travel to other parts of the body. The tumor becomes a contained mass of cells that will stay and affect its immediate environment. The fact that a benign tumor will not spread is good news in itself. This, however, doesn’t make malignant tumors safe. If they grow too big and put undue pressure on a primary nerve, a main artery or compress the brain, the results could be catastrophic. The most popular causes of such growths include trauma to tumor location, chronic inflammation, undetected infections or improper diet. This makes tumors a threat even to people whose genealogy doesn’t have tumor histories. A protective sac often surrounds such tumors. The sac is the body’s immune system trying to segregate the growth and its malformed cells from the rest of the body. While this rarely contains the situation, it makes it easier for surgeons to get rid of the tumor during an operation. If diagnosed with a benign tumor, your doctors will first monitor it and identify its immediate danger to the body. While the tests are running, it would be wise to shift to an anti-cancer regimen since some benign tumors could easily turn malignant. The ultimate way to getting rid of the tumors is through surgery. If all goes well, the surgeons will get rid of the growth at first attempt. There might not be a need for repeated chemotherapy and radiotherapy since all the infected cells can be removed in a single operation. Symptoms are hard to master especially if the tumor lies a distant from major nerves, organs or blood vessels. The first kind of symptoms to expect are bodily pains. The pain will be local to the affected region. If you are dealing with a brain tumor, expect constant headaches while fibroids will lead to pains in your womb. Talking to your doctor once a scan turns positive on a tumor is the best way to identify the way forward. While some malignant tumors are ignorable, doctors will always advise on getting rid of the growth if you can. Benign tumors rarely respond to chemotherapy hence you will have to undergo some form of intrusive surgery. This is always the best way out especially if the tumor is in an operable part of the body.